Wow. I have seen what Hollywood does to books and frankly it terrifies me. TrueBlood comes to mind. I do love both the books and the series. However I had to divorce one from the other because they are so radically different. If it was not going to be butchered and changed into an entirely different entity I have several books I would like to see. The Eternal Series by Jennifer Turner. There are a lot more I know. I may come back and edit to add them. Actors in them - really don't know at this point. Might have to edit for that one too. In honor of Banned Books Week, what is your favorite “banned" or "frequently challenged" book? I do not even know where to begin. With Are you there God? It's Me Margaret by Judy Blume or with The Giver by Lois Lowery? Or should I start with a classic like Farenheit 451 by Ray Bradbury To Kill A Mockingbird by Harper Lee? Maybe I should name a more recent book. How about Harry Potter by J K Rowling or TTYL; TTFN; L8R; G8R Series by Lauren Myracle? How about The Bluest Eye by Toni Morrison? I could go on and on. I have two list on my blog of Banned Books, List 1 ; List 2. Take your pick of any I have highlighted. They all have enriched me. None harmed me. Losing the right to read any book is what would harm me. I told him to put some underwear on after his bath. Apparently I should have told him where to put them on. I agree with the books and series you chose! These would definitely make great movies! Happy Friday! Hopping through. I think Chicagoland Vampires and the Fever series would both be fabulous movies. That gives a whole new meaning to "bottoms up!" LOL. I'm your newest follower! I am looking forward to see how they portray Hunger Games. I am a big Twilight fan and am looking forward to that one too. 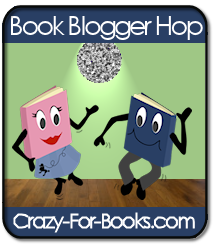 Thanks for linking up with us for the bloghop! Beautiful walkabout! And nice blog! I'm going to read on now! I'm stopping by to give you an award! Great post and blog! Thanks for stopping by and for following. I'm now following you, as well.